I have semi-accepted the fact that Christmas albums are releasing early, although I may not fully understand why the stores light up their establishments with decorations, trees and lights, as early as September. Although the plus side is that it is a special time of the year that is being promoted, believers are celebrating the birth of Jesus Christ, our Lord and Saviour, and it’s always a good thing when everyone is reminded about Jesus and what He has done for us. Now, joining the ranks of Michael W. Smith, 1 Girl Nation and Aaron Shust this year is the indie veteran singer/songwriter Joshua Mills. “…I wanted this album to be deeply spiritual but I also wanted it to be extremely fun because I think God is fun…” A fifteen year veteran worship leader and recording artist, Joshua spent the whole year recording this holiday themed album, during touring and ministering to fellow brother and sisters in Christ. The result is 15 songs of holiday cheer, invoking the spirit of Christmas and the true meaning of why we celebrate the season. While I don’t really recognise that many of the carols though, and I haven’t heard of Joshua Mills prior to a few days ago, I think that this plays in my favour, as I can listen to these songs without any preconceived ideas, so that I can focus our gaze to Jesus, and not on the familiarity of the tunes. Overall, like the other Christmas albums that released early, this album is a joy to listen to- this album has a pop/contemporary feel similar to artists like Jonny Diaz and Matthew West! Opening the track list with the Frank Sinatra classic “The Christmas Waltz”, we are met with a piano centred melody with Joshua warmly and emphatically wishing the listeners a very merry Christmas waltz style. The tempo of the track remind me of the jazz songs in bars and clubs in the 50’s and 60’s, and though Joshua doesn’t sing about Jesus in this song, his heart and intentions to grab our attentions to dwell upon the season, are pure. Though not my favourite Christmas carol, Joshua’s distinct voice fits perfectly with the slower tempo and the soul/gospel feel of the track. Out of all the carols that Joshua has covered, the balance of the track list is more tipped to the lesser known tracks, however there are some songs you’ll immediately recognise. The pace of “Marshmallow World” is the same as Francesca Battistelli’s version, but that’s about all that stay the same. Whiel Francesca recorded an upbeat pop version, Joshua stripped the song down to its acoustic format, with piano and finger clicks anchoring the song musically. This is a song written in 1949, most famously recorded by Bing Crosby, and rerecorded over the years countless times, and as Joshua sings about food, and how Christmas is an overall fun time, “Marshmallow World” does get me into the Christmas Spirit, and is a solid rendition of a lesser known carol. “Angels From the Realms Of Glory”, led by the synth and marching drums (reminding me of “Little Drummer Boy” in that respect, is sung with Beckah Shae on guest vocals. But what is remarkable, is that this song is sung to the melody of “Angels We Have Heard Of High”, with the chorus sung being ‘…gloria, in excelsis deo…’. It’s an ingenious medley of sorts, and I commend Joshua for delivering it with aplomb and professionalism, as we remember that Christmas is all about praising God for being born into this world! Including a medley of the mid tempo pop songs “Come On Ring Those Bells” and “Christmas Vacation” (brilliantly sung by Meka King), Joshua shows us his cheerful and happy demeanour, as he sing with abandon and gratitude, proclaiming that ‘…Jesus is the king, born for you and me…’, across light piano and commanding Christmas bells. Meka also reminds us that Christmas is a fun time to spend with our family and friends in her rendition of the pop classic. “This Christmas”, originally written by Donny Hathaway, is present here also, as Joshua exclaims against the backdrop of a mid tempo piano prominent ballad, that this Christmas will be very special because of the presence of family and friends reminding us that it is the people that make Christmas great, not our presents and other material possessions. The piano led ballad and the album’s first single “It Snowed”, also including the acoustic guitar, speaks about Joshua’s love of snow and how it makes him feel happy inside, as he can spend time with his loved ones while playing in the snow, and the traditional song “C-H-R-I-S-T-M-A-S” (that Joshua never heard a recording of but his family had religiously sung around the tree on Christmas Day) is featured also, complete with Joshua’s grandfather reading the nativity story at the beginning of the track. Although I am guessing that this is a family song from the Mills’ household, as I couldn’t find lyrics anywhere on the internet. But that’s ok, as I love the song, as it speaks about the meaning of Christmas through the acronym- Christ child, Herald angels, Redeemer, Israel, Star, Three Wise Men, Manger, All He stands for, Shepherds. The acronym and song is pretty cool, huh? “Light A Candle”, a upbeat pop/rock 80’s sounding track, sung with LaRue Howard, is a Hanukkah song originally recorded by the folk trio Peter, Paul & Mary; and is meant to remind Jews of the history of their holiday. However I think this piano led mid tempo melody can double up as a mainstream, feel good inspirational song as the theme and focus are the universal traits present in Christianity as well- love, peace, joy and dedication to our faith. While Joshua also included a rare Amy Grant penned Christmas tune “Let The Season Take Wing” in his lineup (this song was only recorded on cassette tape inn 1992! ), which is a mid tempo ballad subtly outlining the reason for the season, and why we celebrate December 25th in the first place; and also the instrumental orchestral like piece “The Nutcracker: Dance Of The Sugar Plum Fairy”, a dance meant for a ballerina in the ballet The Nutcracker; it’s clear that Joshua handpicked these songs regardless of whether they were popular or not, and more so based on what was important to and resonated with him. Paying tribute and homage to his heritage, Joshua expertly and wonderfully covers the oldest Canadian carol ever- “Huron Carol”, where the mysterious tempo and the presence of the glockenspiel perfectly complements the imagery and metaphors included in the lyrics. Designed to create a place where we can worship God, what these lyrics do is remind us of a God who is faithful, as Joshua ardently cries out ‘…come kneel before the radiant Boy who brings you beauty, peace and joy, Jesus your King is born, Jesus is born, in excelsis Gloria…’, with the lyrics drawing me in to sing along as well! And while the piano only medley of “Christmas Time Is Here” and “O Christmas Tree” (a piano only track where Joshua relays the enjoyability of Christmas as we spend them with our families, and a ‘worship song’ to a tree, respectively) ends the album, as well as a 10 second message of Merry Christmas from Joshua; it is the two original songs that impact me the most! “Precious Baby” features the talents of Grace Williams on backing vocals, is a subdued, reflective worship anthem led by the keys, which directly speaks about Jesus being our Saviour, that ‘…You’ve come to bring us peace, You’ve come to bring us joy, You’ve come to bring us hope, the miracles that only Heaven holds…’. While the song is soothing and the delivery of the vocals is quite captivating and powerful; it is the earnest and honest lyrics about Jesus that has me respect Joshua’s songwriting all the more! The last original song is “Gift Of Heaven (Heaven’s Kiss)”, once again led by the piano, and this time with lyrics closer to Joshua’s heart. Reminding me of a testimony song of sorts, Joshua sings out three different choruses, all the while reminding us that Jesus is the greatest gift, and that His birth is one of the most important things in history that could happen, so we ought to be thankful, grateful, and remember that ‘…the greatest gift that I’ve ever seen, is the way that You love me unconditionally, the greatest love that I’ve ever known, is how You gave up Yourself, now I’m never alone, cause You gave it all…’. Well done Joshua for your collection of original and traditional Christmas carols, and well done for introducing me to obscure carols that I will surely introduce to others as well! “…When I think about Christmas, I think about what happens at Christmas that doesn’t happen at any other time of the year. That we get to celebrate the things that are dearest to us: the people, the places, the atmospheres, the food….the music. 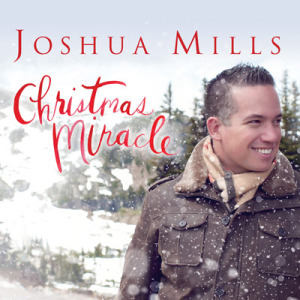 Everything that we love so much it all comes out at Christmas to celebrate the miracles that the holiday represents…” This is the first album I have heard from Joshua Mills. I suppose it’s hard for me to judge the artist’s discography just from one album, and a holiday themed album at that, however Christmas Miracle is so musically and lyrically strong, that I have been won over as a fan. I will definitely check out the rest of Joshua’s studio albums, and his non-Christmas songs as well! I would also encourage everyone else to check out Joshua’s album; this is a pop/acoustic record, meant for fans of artists such as Josh Wilson and Jonny Diaz. Well done Joshua for recording a beautifully sung and brilliantly performed album about the true meaning of Christmas!